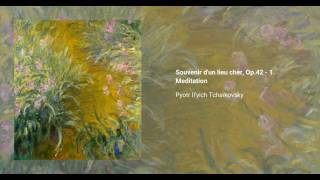 Pyotr Ilyich Tchaikovsky wrote Souvenir d’un lieu cher (Memory of a dear place; Воспоминание о дорогом месте), Op. 42, in 1878. It is a piece for violin and piano consisting of three movements, called Meditation, Scherzo, and Melodie. The set was published the following year, and in 1880 the Meditation was also published separately. It has since gained popularity as an independent piece. In 1896 an orchestral arrangement of the three pieces written by Alexander Glazunov was published, and this has since become the most popular form of the work.